I was intrigued by these plants when they arrived and I have had to buy one! The look just like Acers, excep they are not. It is actually a strange variety of Elderflower. The leaves are narrow and divided and a dark red almost black clolour. When in flower it no longer resembles an Acer and its frothy pink and white blooms show its true identity! This planting is in the Garden in the Lane garden . How is this plant doing? I’ve got one which isn’t growing as well as I would like, purchased and planted a couple of months ago, when it was about a foot high. 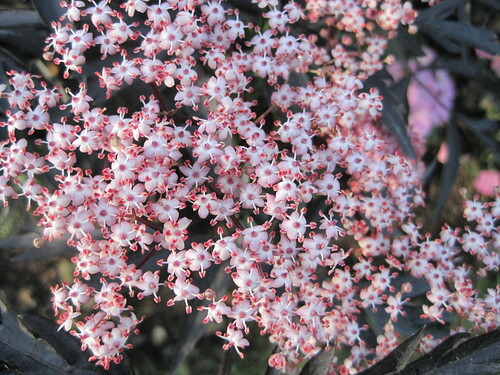 What kind of starting point did you have for your Sambucus and how established is it now? Mine has not done a lot since I planted it, either! Infact the youngest leaves are looking a bit more green than black! It has not flowered either, but by the time I got round to getting one home the plants with blooms on had already been sold. I’m hopeful for a show next year. It was about 18 inches tall when I bought it and may be only about two foot now, but I will be quite pleased if it stays small, and I think I will have to prune it to keep it in its place! Perhaps they take a time to establish? I’m a bit worried I’ve bought something that will become too big over time? Have you got a large space to fill and it is not living up to expectations?